GIANT PLAYMOBIL vehicles are being rolled out at intu Lakeside before Christmas to bring the famous toy brand to life for children in Essex. They will have the chance of becoming a real-life PLAYMOBIL character by choosing between a police or fire car in which to cruise the malls as part of their family’s day out at the centre. 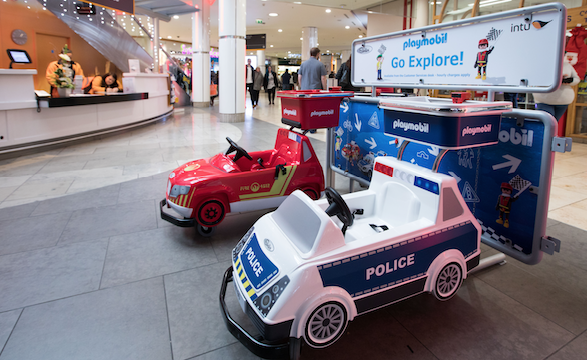 The fun buggies have been exclusively created for the ongoing partnership between PLAYMOBIL and intu and will feature at four other popular intu centres this month. PLAYMOBIL is also the official sponsor of intu Lakeside’s new family club which rewards members with exclusive offers and discounts including a free PLAYMOBIL toy. The PLAYMOBIL fun buggies are available from the intu Lakeside Guest lounge, on level 2 by M&S.